This is a review of Gonesh wax melts. 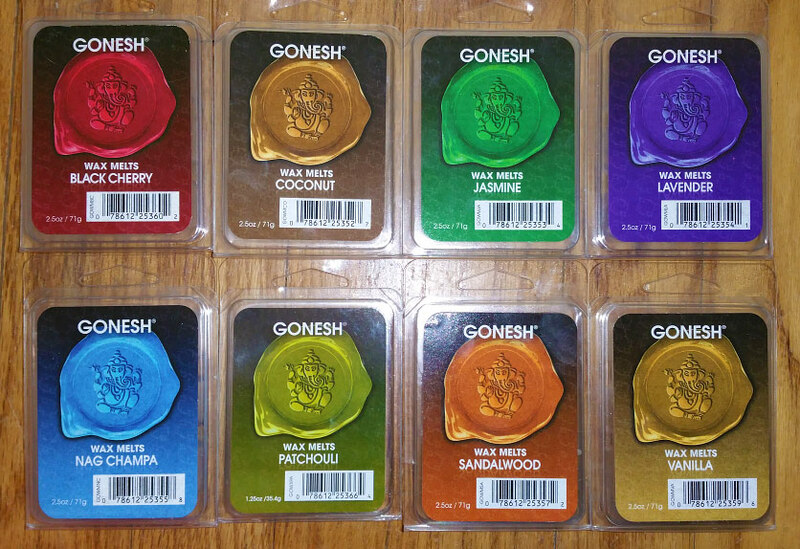 Gonesh has been selling incense cones and sticks since the 1960's. They also now sell candles, potpourri, scented oils, air fresheners, sachets, accessories, and more recently, wax melts, which can be found on the Gonesh website. Currently only a few scents are available in wax melt form. Each wax melt is $1.99 for 1.25 oz. When I purchased mine, the website said 2.5 oz. (which has since been corrected) but I received 1.25 oz. clamshells. So I called the company and spoke to Melanie. I have to give a shout out to Melanie for providing such fantastic customer service. She was very friendly and helpful on the phone, and sent me 2.5 oz. wax melt replacements plus a tealight warmer at no charge. And shipping was super fast! Because of this exemplary customer service, I would not hesitate to purchase from Gonesh again! I believe the 2.5 oz. wax melts are available, but you might have to call the company to get them, and I don't know what the cost is. Interestingly, the 1.25 oz. melts use hard wax, and the 2.5 oz. melts use soft wax, although both formulas are a soy blend. So I've reviewed both of them. I find that soft wax often does not throw as well as hard wax, but that was not the case here. An artificial cherry scent with the slight tartness of black cherry. It has a bit of a cherry cough syrup vibe, but I still like it. I only reviewed the soft wax. It's a nice plain coconut scent with a slightly nutty note. It's very bland and is not sweet at all. But it's the perfect coconut scent to be used as a mixer. Coconut is like vanilla or pine; it can be mixed with anything! Try mixing coconut with vanilla, lemon, florals, fresh scents, bakery scents like chocolate or caramel, fruity and woodsy scents. I only reviewed the soft wax. It's a fantastic sweet jasmine perfume scent. A nice lavender scent, not sweet, but not medicinal either, and it doesn't have that slightly eucalyptus note that authentic lavender scents tend to have. Throw score applies to both the hard and soft wax. This is definitely Nag Champa, that sweet incensey scent with a very slight baby powder note. Fantastic scent, and always a favorite of mine! Compared to ScentSationals Nag Champa Incense, they're almost the same. The Gonesh version has more of a baby powder note and I think it's a little more of an authentic Nag Champa, while the ScentSationals version has a sharper, sweeter note with a smidgen of orange blossom, and it reminds me a little bit of men's "Canoe" cologne aftershave. The notes for the ScentSationals version are, "Warm woody patchouli swirled with hints of golden amber, rich musk and oriental spices balanced by undertones of orange blossom and jasmine". I love both versions, and throw score applies to both the hard and soft wax. Although I do smell the patchouli, this is more of a fresh, soapy, perfumey scent with an incensey note. It's very similar to, if not the same scent as, the Pier 1 Patchouli scent. I love it! It smells slightly similar to the Nag Champa scent. Sandalwood is actually a light, milky wood scent. But this is a nice men's cologne scent with a hint of woodsiness (not smoky). Throw score below is for the hard wax; the soft wax had a throw of 2.50 out of 5. A plain vanilla cupcake type scent. It's a bit artificial, like vanilla scented car deodorizer. Still an OK scent though.